As May comes to a close the weather is nothing short of beautiful, if not a bit on the hot side. It looks as though we may be in for another early summer drought, however, as most of southern Minnesota hasn’t seen any significant rainfall in two weeks and the immediate forecast shows little or no rain. There is, however, a chance of thunderstorms later next week as the temperature remains in the high 70’s to mid-80’s. 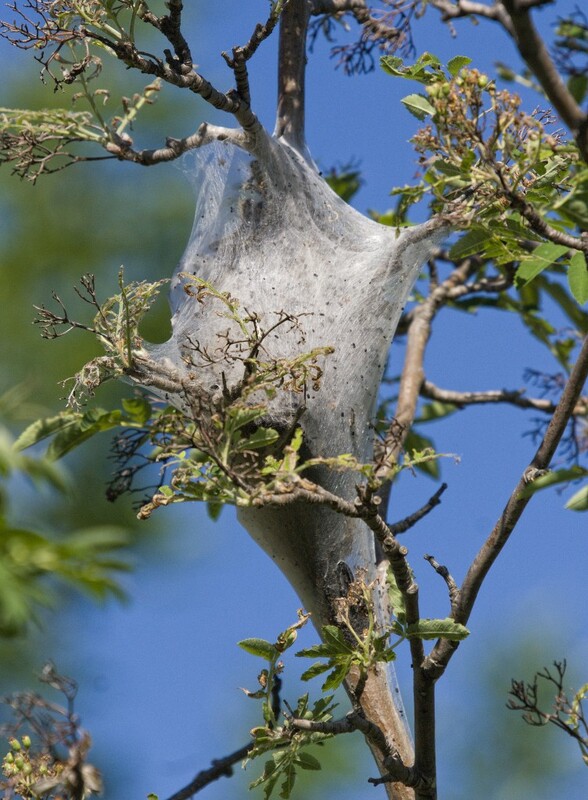 And now, to reveal the menace threatening southern Minnesota’s trees alluded to in last week’s post: tent caterpillars. These voracious beasts, generally no larger than a couple inches in length, can be found feasting on the leaves of small trees in southern Minnesota just about everywhere you look right now. Here in the Arb we began seeing their silk tents (which are woven shortly after the caterpillars hatch from their eggs) in April, and since then some young trees have already been entirely stripped of their foliage. The tents serve as thermoregulatory devices; in other words, these structures help catch the sun’s rays and warm up the caterpillars’ bodies as the larvae rest within the tents’ chambers. The caterpillars require a warm body temperature for proper leaf digestion, and thus when the temperature is relatively cool you will find most of the caterpillars within the tents; conversely, when the temperature is relatively warm, you will find the majority of caterpillars foraging on the trees outside the tents. Young leaves are easier to digest than older leaves, which explains why there is already so much caterpillar herbivory this spring. Tent caterpillar populations are cyclical and more or less follow a ten-year booming (when populations are highest) pattern, but this varies somewhat. While a single year of caterpillar damage won’t kill the trees, several years of sustained caterpillar activity have the potential to do so. It is possible to cut off the affected tree branches, but the caterpillars are most likely dispersed throughout the entire tree. Spraying is an option, but unless you own large tracts of trees that appear to be vulnerable I wouldn’t recommend it as it becomes very expensive and logistically painful (often involving pesticide sprayed from a low-flying airplane). So as your trees become defoliated this summer, don’t fret too much; we most likely won’t see this many tents in 2011. Southern Minnesota’s infestations, by the way, are a far cry from past infestations seen in northern Minnesota in which the caterpillars were literally dripping from trees. European Mountain-Ash infested with tent caterpillars (and showing signs of defoliation resulting from herbivory) west of Interpretive Center, 5/28/10. **I will be conducting grassland bird surveys in June throughout western Minnesota for the Minnesota Department of Natural Resources, and thus my time on campus and in the Linnaeus Arboretum will be very limited. Watch for the next “Arb Sightings” in early July.